This piece contains a mixture of reading and activities. You can read the whole thing, or skim through for the activities. Look for the word TASK to find the activities. The Pythagorean Theorem. It’s kind of a big deal. Just like beauty, right triangles come in many different shapes and sizes. TASK: Go play with the pile of triangles. Separate the right triangles from the rest of the pile. 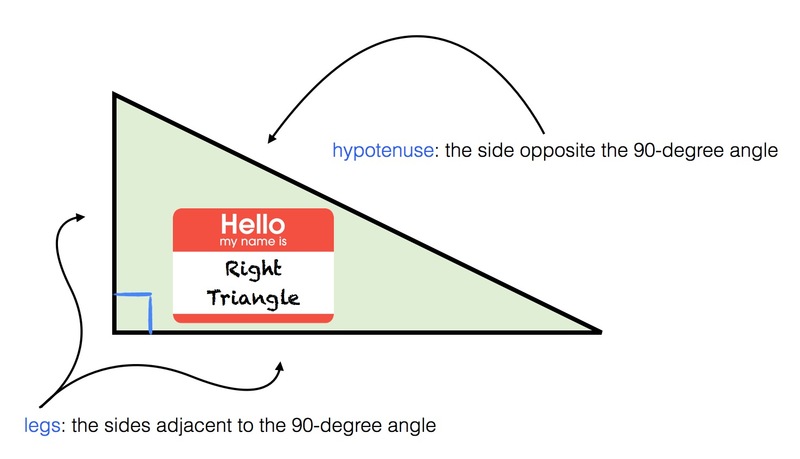 A right triangle will always have one side (called the hypotenuse) that’s longer than each of the other two sides (the legs). The Pythagorean Theorem gives us the following relationship between the three sides. Pythagorean Theorem: in a right triangle, the sum of the squares of the two shorter lengths (the lengths of the legs) is equal to the square of the longer length (the length of the hypotenuse). The theorem enables you to solve problems like this one. 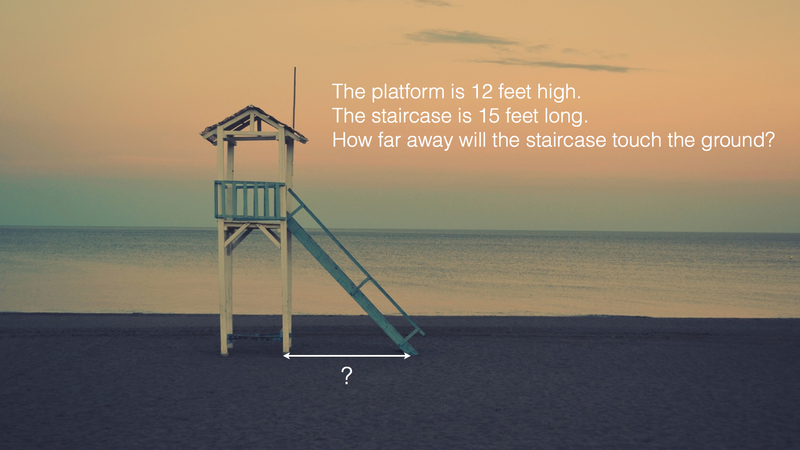 TASK: Compute the distance in the picture above. SOLUTION: Let’s call the ground distance x. Since the 12-foot beam appears to be perpendicular to the ground (i.e. 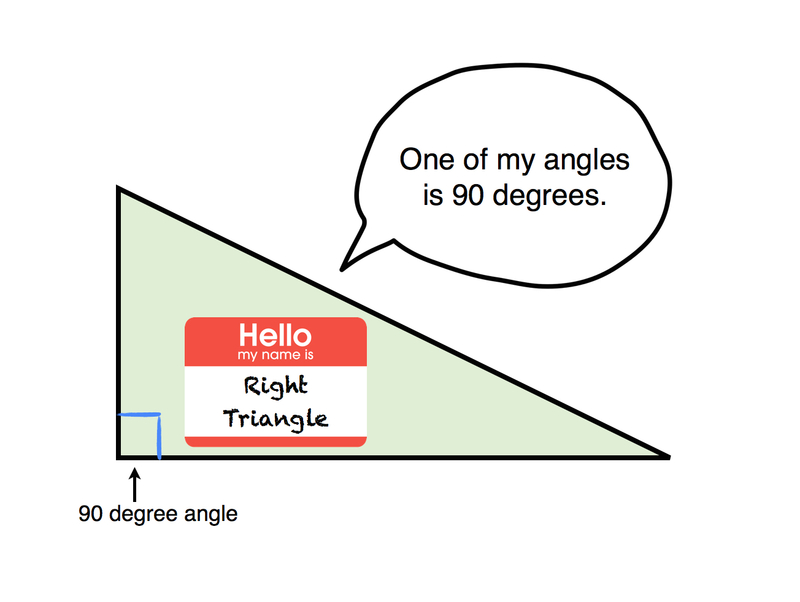 it makes an angle of 90 degrees with the ground), we can identify it as part of a right triangle. Now we use the Pythagorean Theorem. The two legs of the triangle are 12 and x. The hypotenuse is 15. 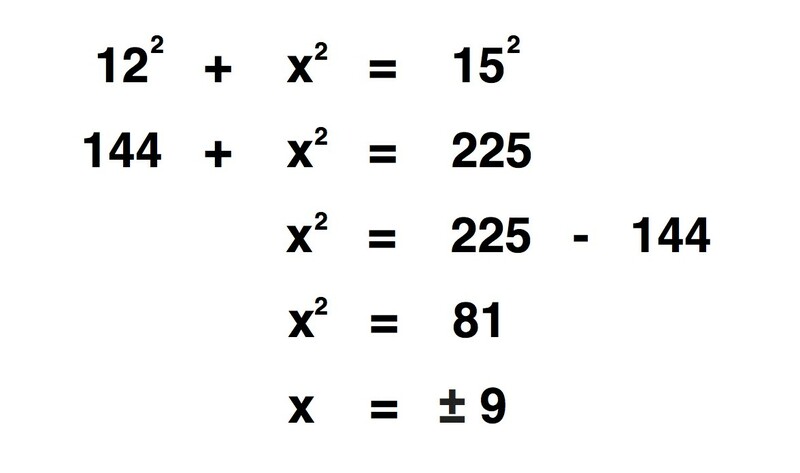 Since x2 = 81, we have x = 9 or x = -9. So… it looks like we have two solutions. Except one of them doesn’t make sense in the context of the problem. Is it possible to have a distance of -9? Not in this situation. So x = 9 feet. The ladder touches the ground 9 feet away from the tower. What does this have to do with your life? Right triangles are everywhere. All you have to do is look around. They were probably used to construct the building you’re in right now. They could be as close as the chair you’re sitting on. I found one under my desk. Do you see it? 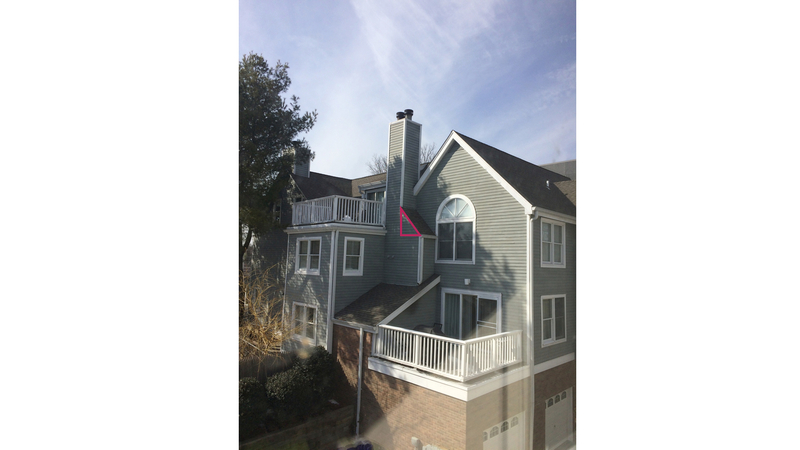 I also found some right triangles outside my window. I outlined one of them in pink. Can you find the other ones? TASK: Identify at least three more right triangles in the picture above. TASK: Identify the closest right triangle in your physical space. Pay attention to furniture, ceilings, staircases, clothing, electronics, roofs, etc. Note that the nearest right triangle may be behind you. Ok. Were you longing for something more majestic? 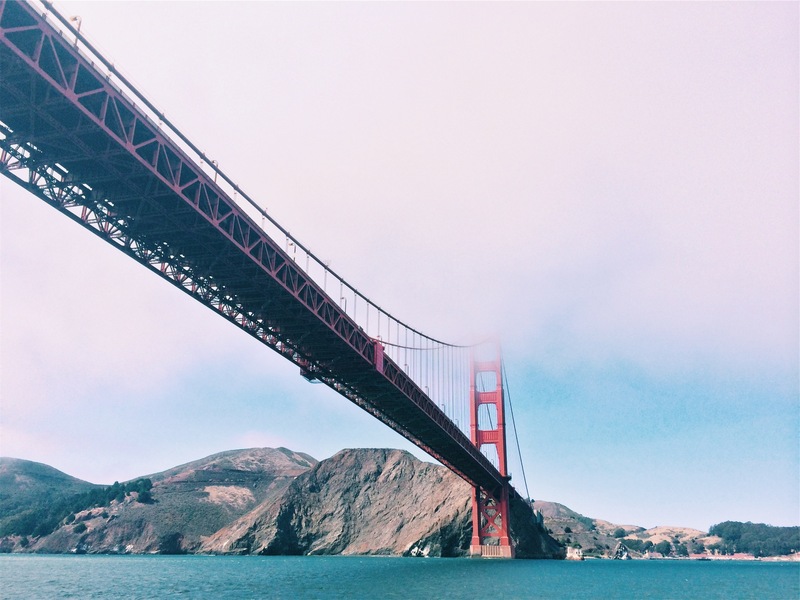 See if you can find any right triangles in the Golden Gate Bridge. 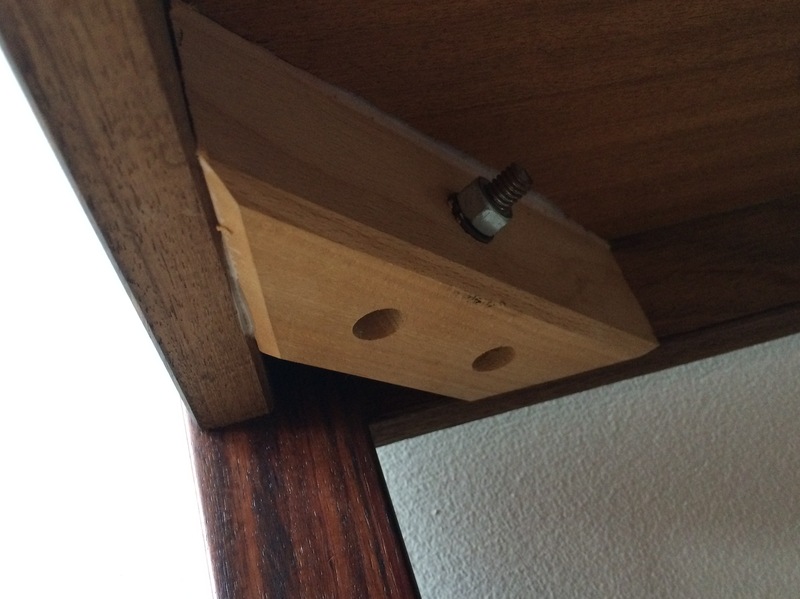 Every time you see a right triangle in your world, either in a bridge, or the railing of a staircase, or a ramp, or the beams on the ceiling, it means someone somewhere was using the Pythagorean Theorem. Remains of my last minute Halloween costume. I dressed up as a puzzle. I taped numbers all over my pants. They were sorted into 2 clumps: one clump on each leg. All the numbers on my left leg had something in common, and all the numbers on my right leg had something in common. Hint: none of these numbers is divisible by 3. Can you figure out why the numbers are sorted this way? Seen at a museum gift store. This designer made a curve out of straight lines. Can you find other ways to make a curved shape of a bunch of straight lines? Four people are gonna have lunch at a circular table. 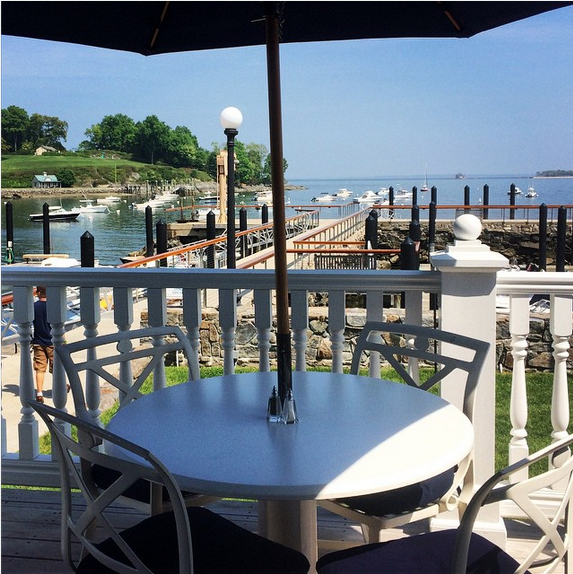 There’s an umbrella pole at the center of the table. How might you arrange the chairs so that everyone can see everyone? PS: The arrangement pictured, where each chair is 90 degrees away from its neighbors, does not work, because people across from each other have look through the center to see each other. PPS: one solution is just to put everyone right next to each other, leaving a whole half of the table vacated. Then no one has to look through the pole to see anyone else. But are there any solutions that distribute the 4 people around the table more evenly, minimizing the portion of the circle that is left vacant? 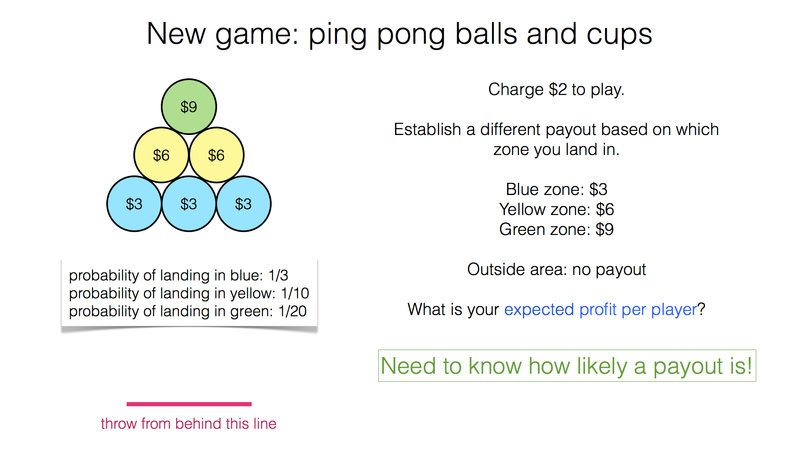 Ordering games involve estimation and comparison, two essential skills for mathematics. Some groups were very enthusiastic about this game; others not so much. In the future it might help to do one “practice” round with numbers like 1,2,3,4,5, so that each group could get a feel for what they are trying to do and what a successful ordering looks like. Each ordering game below is geared to a different skill level. The cards are not necessarily in order as pictured. Finding areas enclosed by curves. I gave this to students in a calculus class, but it could also be great for eager students who haven’t learned calculus yet. It can be completed without any calculus. I feel I have only scratched the surface of what can be done with ordering games. It would be cool to create decks of cards (several different decks) like this. You’d need an ordering game of 13 items. The concept of suits (clubs, diamonds, hearts, spades) would be preserved. Just as in a normal deck, there would be 4 copies of every number. However, math skills would be required to sort the cards. For instance, instead of relationships like “a jack is higher than a 10” you’d have relationships like “a card with log(11) is higher than a card with sin(89 degrees).” Students could then play classic card games with each other, using the mathematical card decks. They’d have to swap out decks periodically to avoid getting too familiar with one deck and memorizing the orderings. Eventually students could design decks for each other. This would involve thinking of 13 numbers that are obscure enough to make people think, but “easy” enough that no laborious calculations would be needed to compare them to one another. 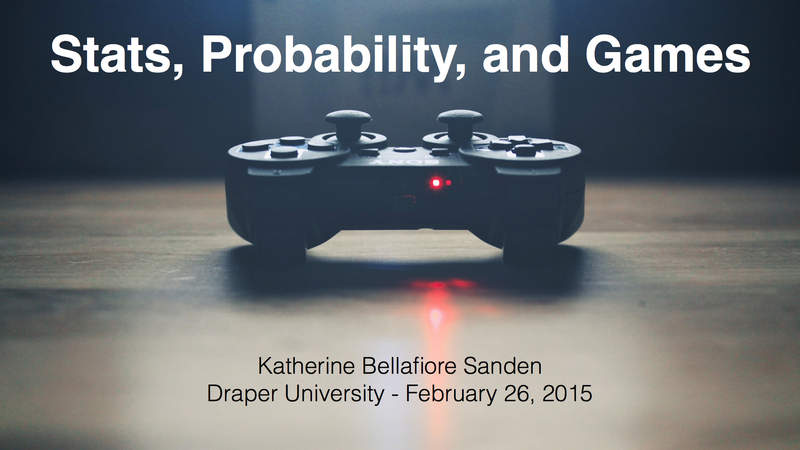 This is a recent math workshop I did for the students of Draper University in San Mateo, California. 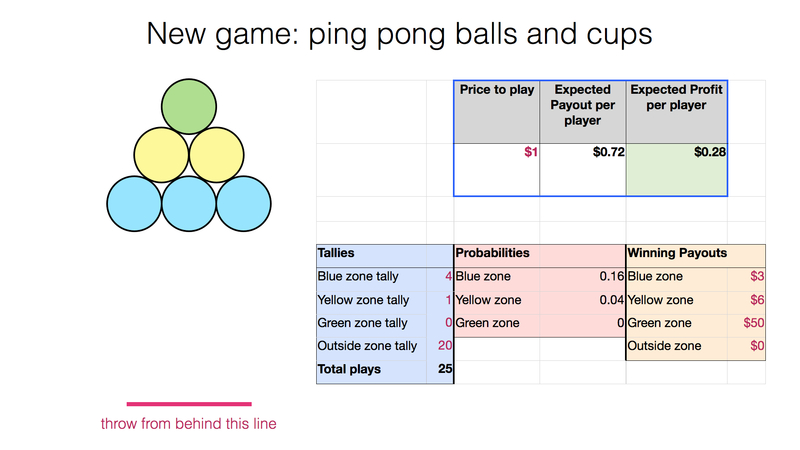 It presents basic probability theory in a fun and accessible light. Draper University is a two-month long intensive program for aspiring entrepreneurs. Throughout the course, students work on small teams to complete challenges designed to build creativity, problem-solving skills, and business sense. When I came, students were preparing for a carnival, where each team was designing a booth. Teams were competing against each other in a winner-take-all model: whichever team made the most profit would get to keep all profit from all teams. 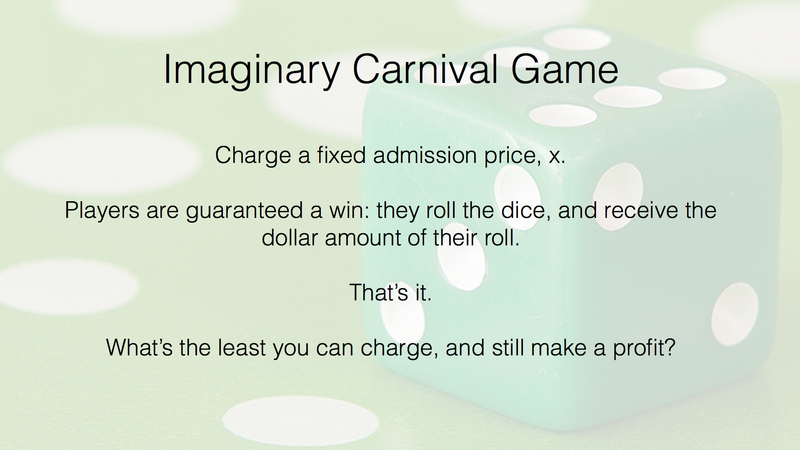 I wanted students to understand basic probability and outcome analysis in order to optimize their pricing and payout strategies at the carnival. 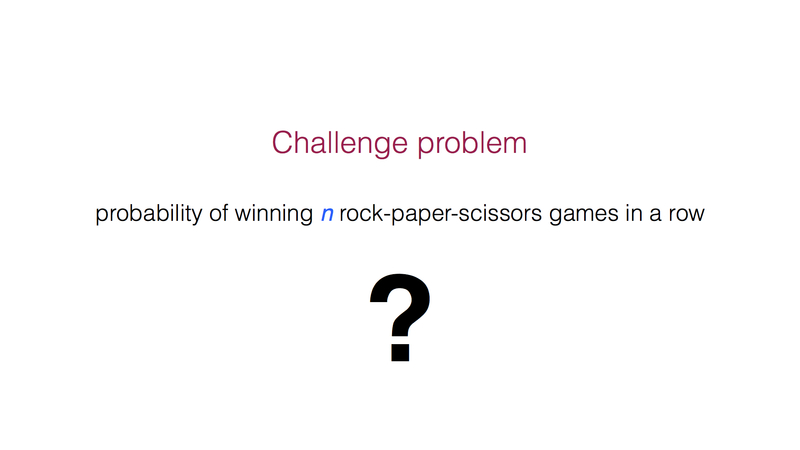 I interspersed Challenge Problems throughout the presentation. 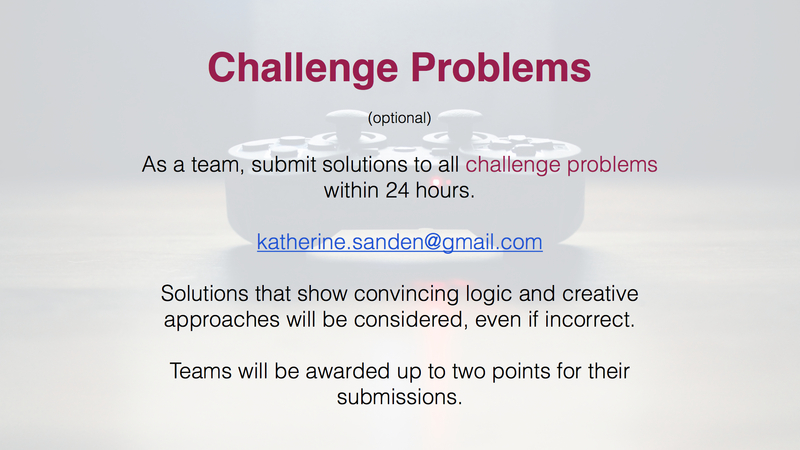 Teams who submitted solutions to these problems were eligible for extra points on the program-long team scoreboard. 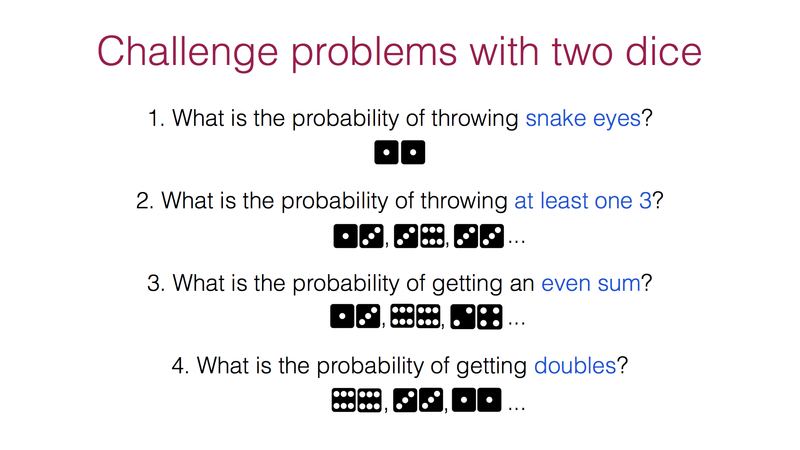 We reviewed the difference between probability and odds — two words which are often used interchangeably, but have different mathematical meanings. I have always wondered if the concept of odds was invented by casinos and lotteries to make their games more attractive. Instead of comparing the winning event to all possible outcomes, they can compare it only to the losing outcomes, making it seem more likely. Doesn’t “2 to 1 odds” sound better than “0.67 probability”? And then played a huge rock-paper-scissor tournament. Note that there are 9 possible outcomes, but only 6 possible outcomes that end the game, three of which are losing outcomes, and three of which are winning outcomes. I recently read Delivering Happiness, by Zappos founder and CEO Tony Hsieh. Hsieh writes about the story of Zappos, as well as the research he did on human happiness. He notes that one of the main factors contributing to happiness is perceived control. Not necessarily control, but perceived control. 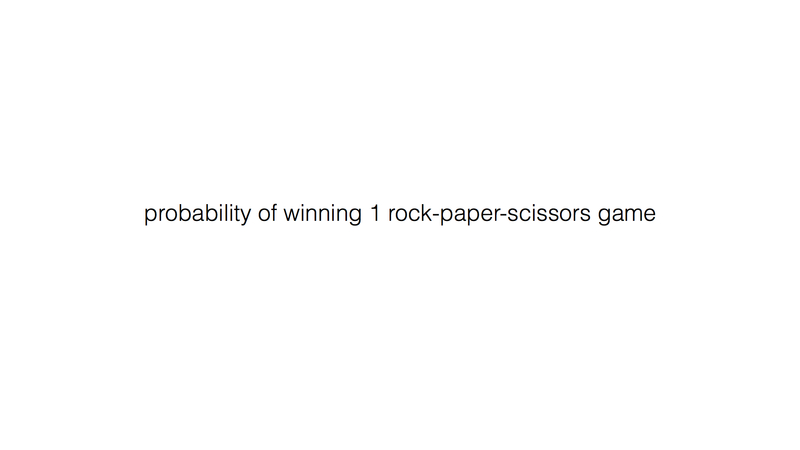 Rock-paper-scissors is a perfect illustration of this. Why else would we prefer it over a coin toss? 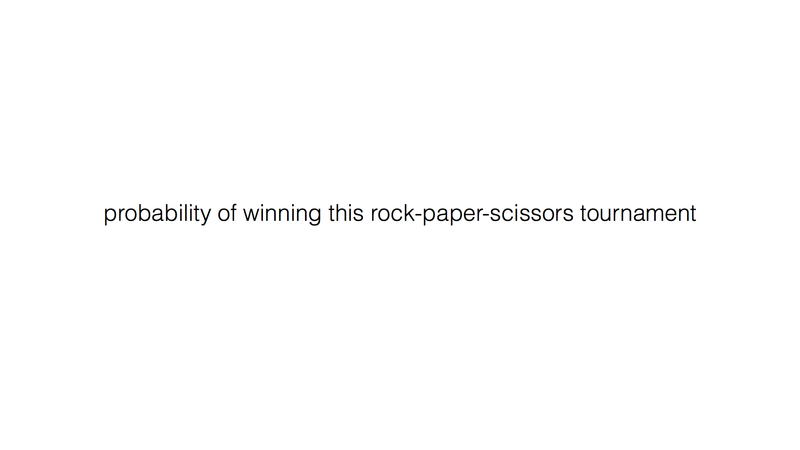 We believe that by choosing between rock, paper, and scissors, we somehow have control over the outcome. Another factor that contributes to happiness, according to Hsieh’s research, is human connection. Since rock-paper-scissors involves synchronization, some eye contact, and body language, students remarked that it creates more opportunities for laughter, creativity, and human connection. 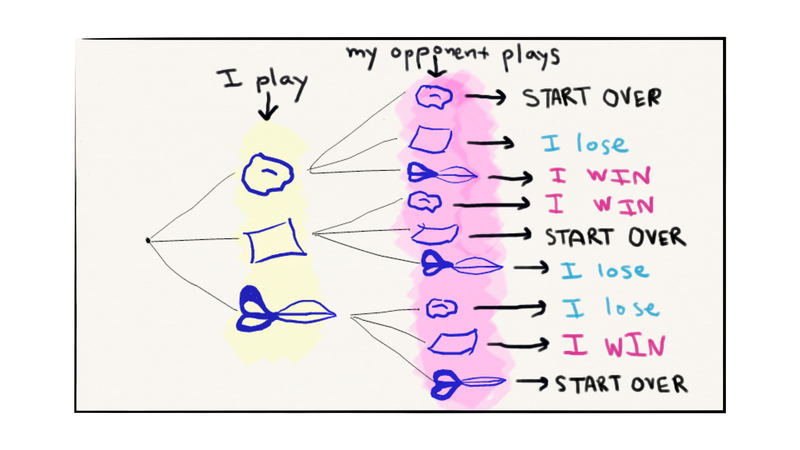 For instance, many players like to act out the outcome: if I played paper and you played rock, I might wrap my hand around yours to assert my victory. 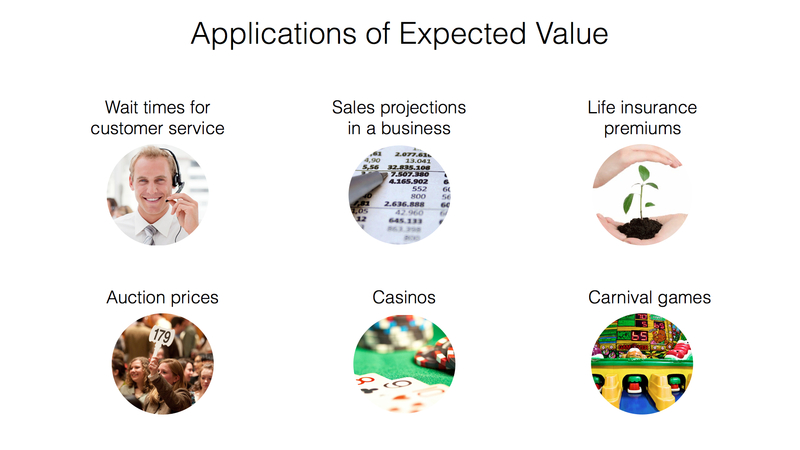 The bottom line is, there is more than mere numerical probability in these activities. 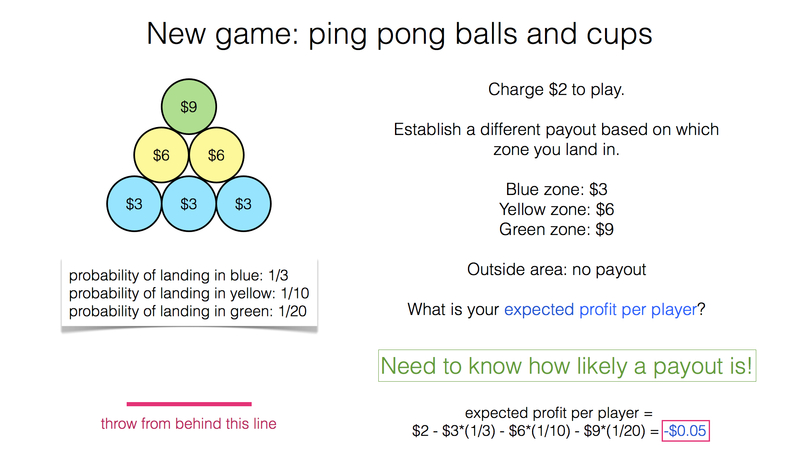 By maximizing the psychological “payouts” of your game, you can increase its appeal without lowering your profits. One team ended up utilizing this at the carnival by making a dunk tank: zero monetary payout, but a huge experiential reward — watching someone get soaking wet due to your throw. The winner of our tournament won five games in a row. 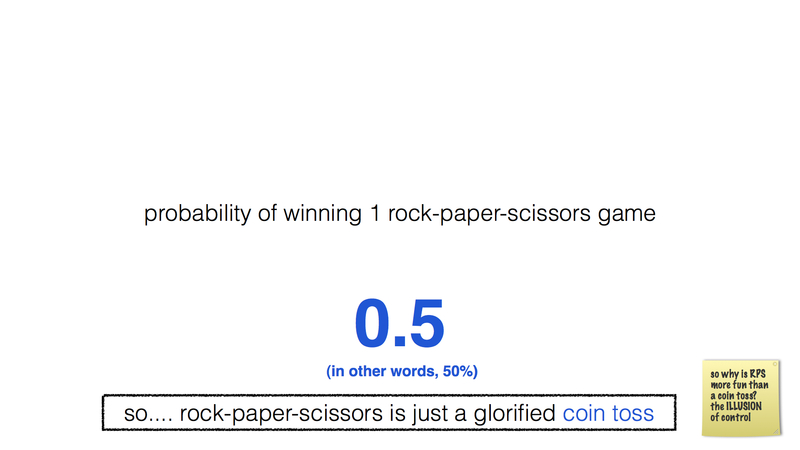 We found that the probability of winning five games in a row is (1/2)^5, or 1/32. That’s about 3%. 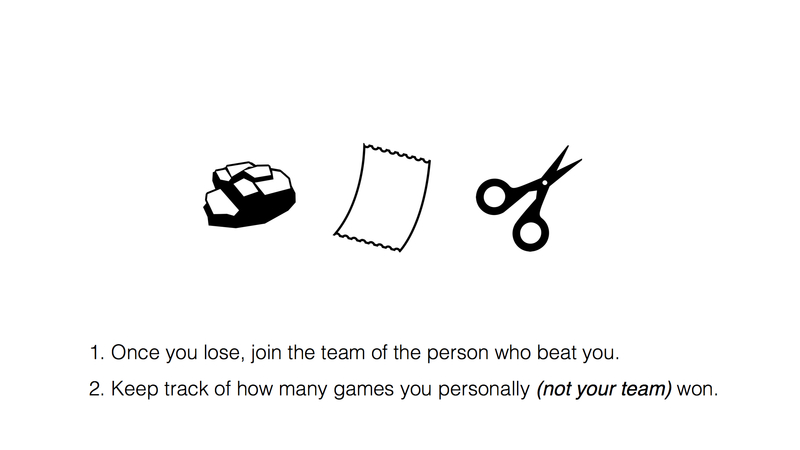 Can you make a general formula for the probability of winning n games in a row? Yes, if we charged 5 million dollars, we would make huge a profit every time someone played. But no one would want to play. So what is the least we could charge, while still making a profit? The class was divided. Some people said $3.01; others said $3.51. Others were unsure. This is was our doorway into discussing expected value. 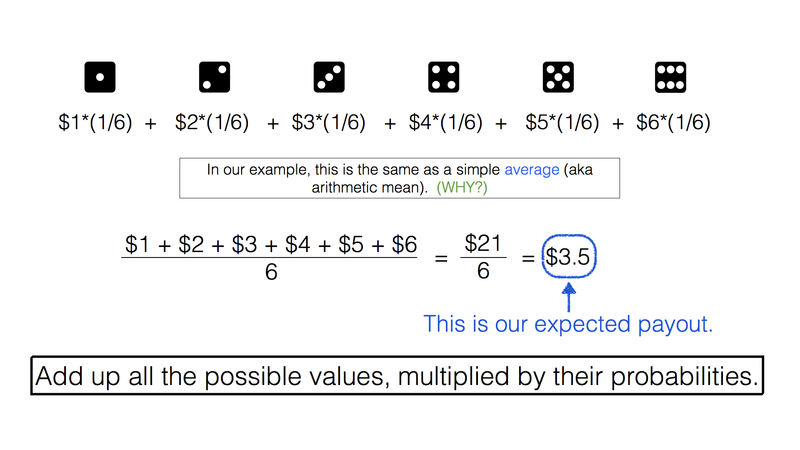 In the example with a fair dice, the expected value is the same as the average, because all the outcomes are equally likely: all have a probability of 1/6. 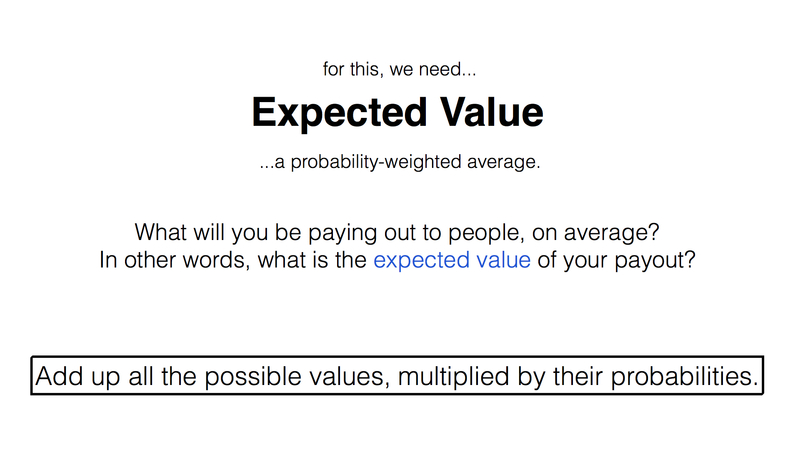 If they had different probabilities we’d have to multiply the value of each outcome by its unique probability. We’ll see an example of this later on. 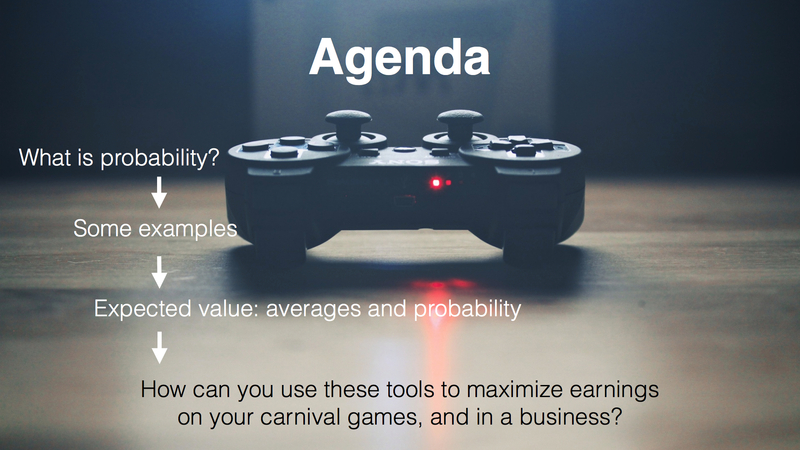 Expected value has endless applications but we focused on its application to carnival games and casino-style games. 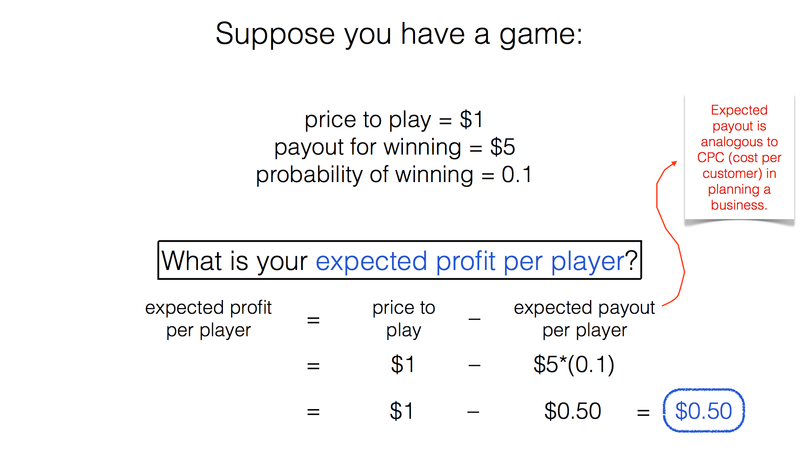 Here’s a simulation of how the expected profit per player is affected by the price to play, amount of payout, and probability of winning. Click here to edit this spreadsheet and see how the results change. Now, what if you had multiple levels of payouts? 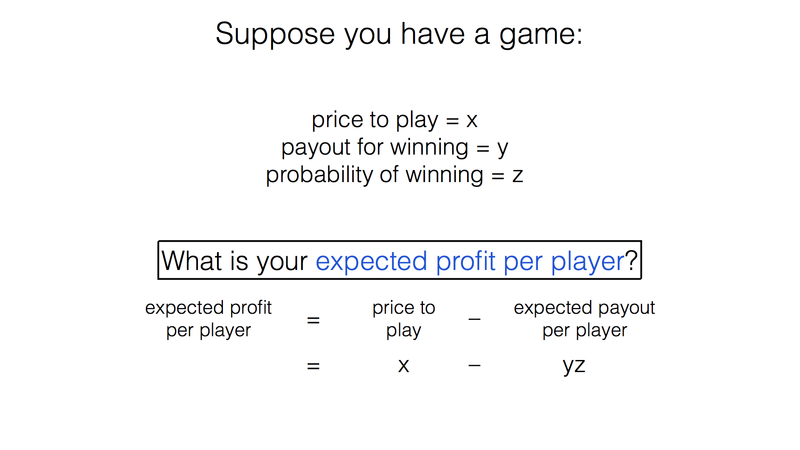 No one knew how to calculate the expected profit per player. Why? 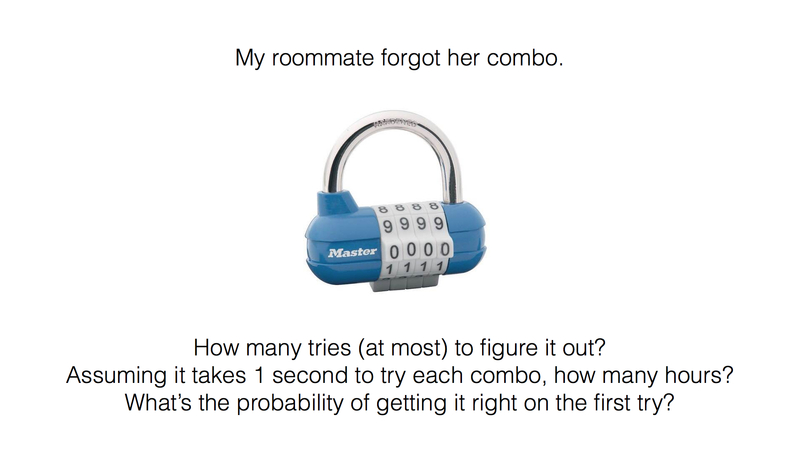 We don’t know any of the probabilities! Suppose we did know the probabilities of hitting each zone. 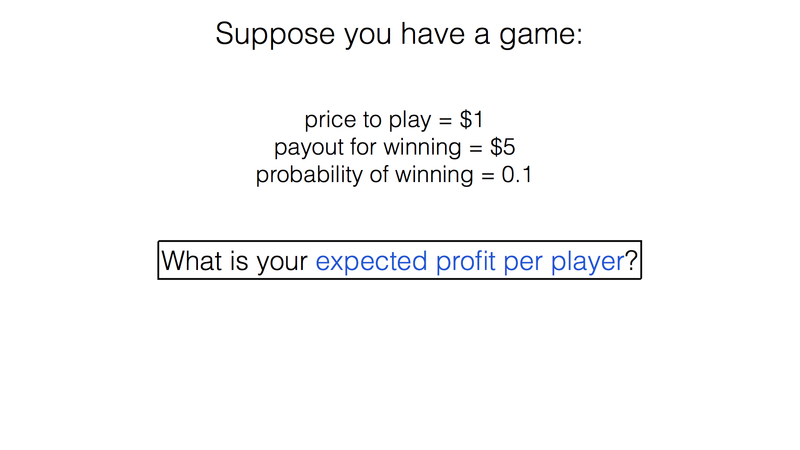 Now we are able to calculate the expected profit per player (assuming these probabilities are legitimate) (are they? where did they come from?). expected payout per player = $3*(1/3) + $6*(1/10) + $9*(1/20). This game ends up being a loss for the house. The expected payout is 5 cents more than the price to play. 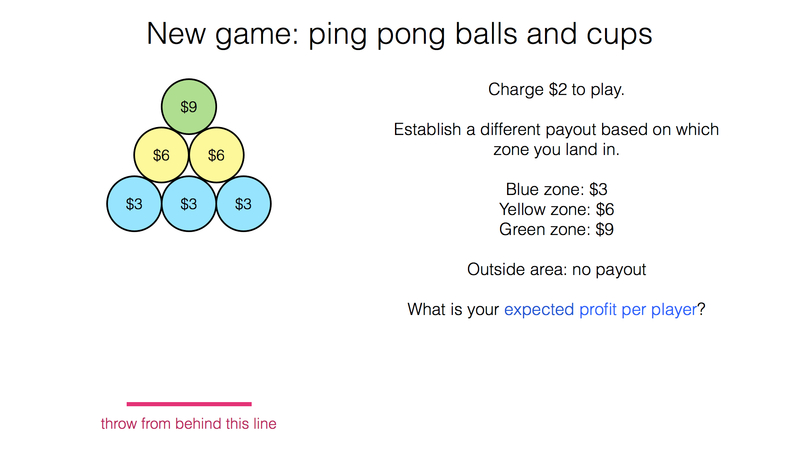 This means that on average, we are losing 5 cents for every person who plays. We did another simulation. 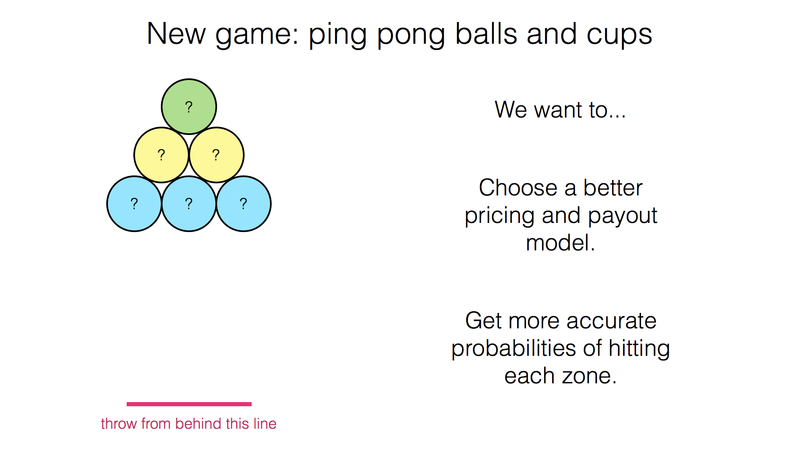 To get more accurate probabilities, we built a real-life model of the game and each of us took a shot. Surprisingly, no one was able to hit the green zone. Hitting the blue zone was pretty easy but many people aimed for the green and yellow zones and instead got nothing at all. Here are the results of our simulation. We were emboldened to increase the green payout to $50 because no one was hitting it. Here is a spreadsheet where you can simulate it yourself. The red numbers are the ones you have access to change. The black numbers are calculated automatically from the red numbers. Click here to access and modify the spreadsheet. 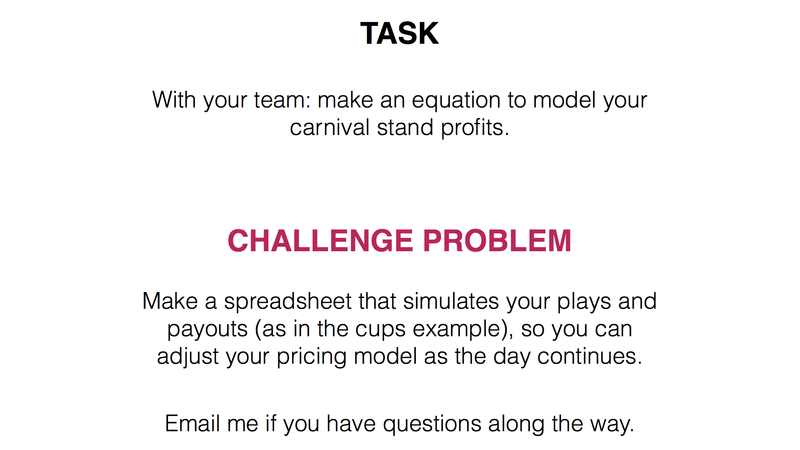 I spent the next 5 minutes letting teams work on the task below and answering questions. That’s when we ran out of time. 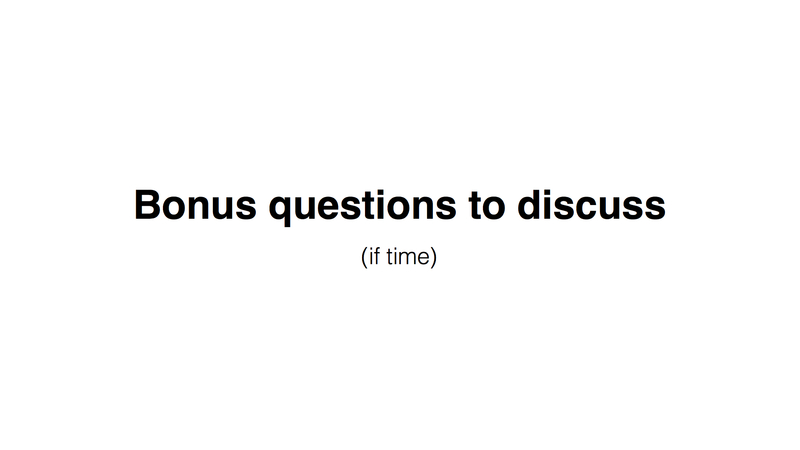 Check out the bonus questions! 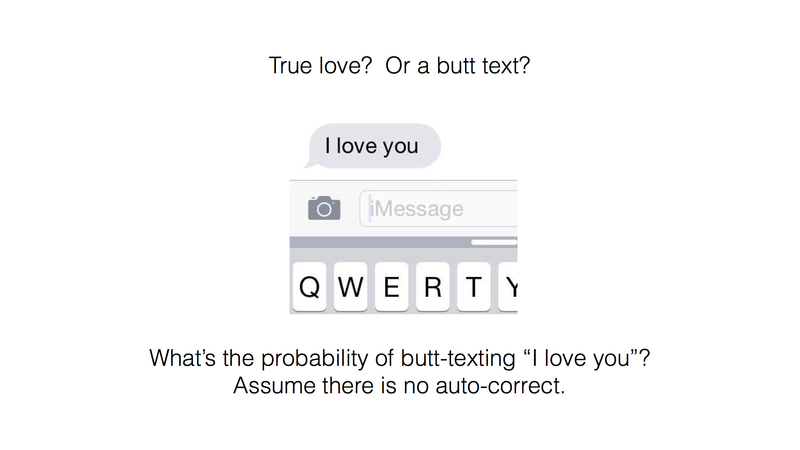 You’ll find that, without autocorrect, the probability of accidentally texting “I love you” is very, very low. The probability of getting just the “I” would be around 1/50, because there are roughly 50 characters (26 letters + punctuation) on a typical texting keyboard. By the time we get to “I” with a space afterwards, we’re already down to 1/2500. That’s less than 0.04%! However, with autocorrect, it’s a different story. You could push something like “Umkocdeyi” and suddenly you’ve notified your boss that you love her.